I have been a volunteer tennis coach for the Special Olympics in Mercer County, New Jersey for over 10 years, and I can confidently say that it has been one of the most rewarding and enjoyable experiences of my life. As I write this post, the Special Olympics USA Games, which occurs once every four years, is going on right here in my backyard, the Princeton, New Jersey area. I am not working at the USA Games, but am supporting all of these inspiring athletes, especially the ones that I work with during the year, Laura Kasper (tennis), Ray Truitt (tennis), and Joey Clawson (flag football). This USA Games includes 3,500 athletes in 16 different sports, including: aquatics, athletics, baseball, basketball, bocce, bowling, cycling, flag football, golf, gymnastics, powerlifting, soccer, softball, tennis, triathlon, and volleyball. Every state in the country is represented. The theme of the Opening Ceremonies this year was "Inclusion," with supermodel, Brooklyn Decker and NBA star, Michael Carter-Williams as MCs. There are over 10,000 volunteers, 1,000 coaches, and 70,000 family, friends, and spectators. Cessna donated planes to fly in 800 athletes from all over the country and even deliver their luggage to Rider University and The College of New Jersey. Derek Jeter even promoted the Games with a PSA on the YES Network. Needless to say, the Special Olympics has a tremendous amount of supporters, but unless you have experienced an event in person, you don't know exactly how amazing it is. And that is why I decided to write this post. I am a volunteer coach for many special athletes, but more importantly, I am a friend to them, often going out for pizza, watching a movie, or playing wiffleball. To me, the Special Olympics not only represents tremendous athletes who love their sport, and give a full effort every day, regardless of the results, but also about the generous volunteers, and friendships formed. It's unity. It's love. And it's something we can all learn from. 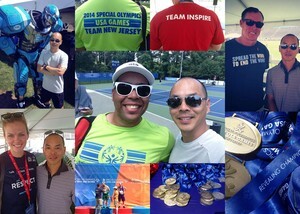 I spoke with Marc Edenzon, President Special Olympics NJ, consultant for the 2014 USA Games, and father of a son with an intellectual disability. Edenzon: "The Special Olympics brings a community together from the athletes, supporters, volunteers, sponsors, and spectators. The volunteers gain just as much as the athletes. Theses athletes are educators for everyone involved. We can all learn from them. And it carries over to life." In Princeton, I spent some time with Brooklyn Decker, supermodel, wife of Andy Roddick, and long-time Special Olympics volunteer. "To me, the Special Olympics represents hard work and teamwork...and they don't even get paid," said Decker. "I feel like I get so much more out of this than they do. I still get insecure, in fact I was shaking before speaking at the Opening Ceremonies. I learn so much from these special athletes," said Decker. I also spoke with John C. McGinley, comedian, actor, and father of a son with Down Syndrome. 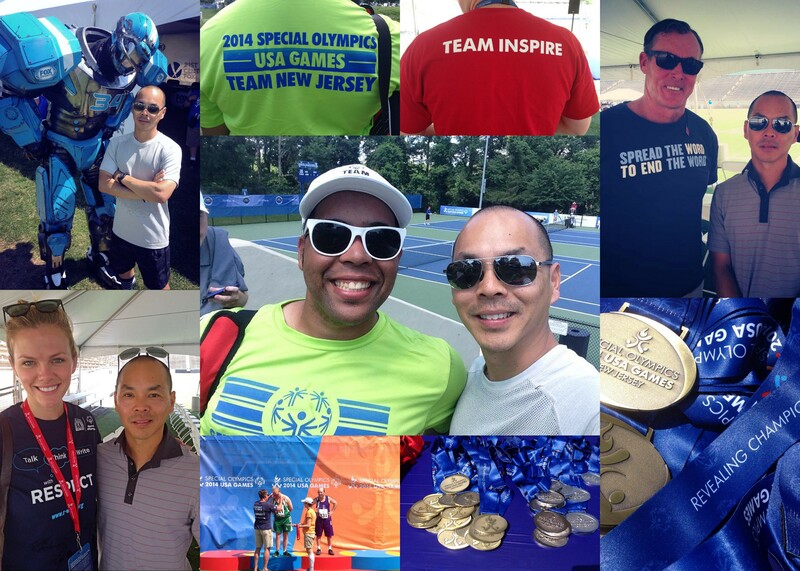 "The Special Olympics is an opportunity to be involved with something bigger than ourselves. It's an unknown outcome with an unlimited upside. I am amazed at how much love there is here, from everyone involved. That's why I keep coming back. There a lot of love, but it's still about winning, as stated by the Special Olympics motto. I definitely get more than I give at the Special Olympics." At Mercer County Park, I chatted with one of my tennis players, Ray Truitt who is a 2014 Special Olympics USA Games athlete. Truitt: "I love the Special Olympics because of the excitement, opportunity to compete, and the community. It has been great to meet athletes from all over the United States, and the volunteers are amazing." I asked Ray if he every feels nervous when competing. "Sometimes I doubt myself, but I just have fun and do the best that I can," he said. Joe Acton, is a fellow coach and a USA Games volunteer. "These athletes play the game the way the game was meant to be played. They are honest, and show tremendous character and respect. It's really how life should be lived. What I have learned from the Special Olympics is that if these athletes can give a full effort and enjoy life even with disabilities, then we can ALL enjoy life, and being alive. It's a choice." "These special athletes just want to be included...just like the rest of us." Where else can we see someone come in last place but completely satisfied because they gave a full effort? The Special Olympics has helped me become a better coach, athlete, friend, son, husband, father, and person...and I have a feeling I'm not the only one.